After the recent cold spell and storm force winds it’s difficult to remember that autumn in the UK was one long extended summer (OK, I exaggerate just a little!). 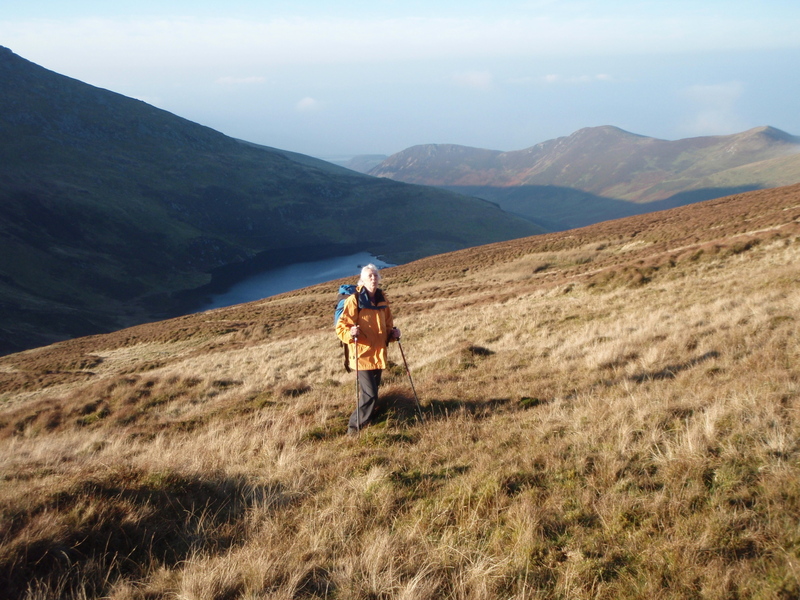 It was late November when we decided on a Carneddau day – it wasn’t going to be too long, as Chris doesn’t much like walking in the dark, and if the weather wasn’t autumnal then the hours of daylight were. 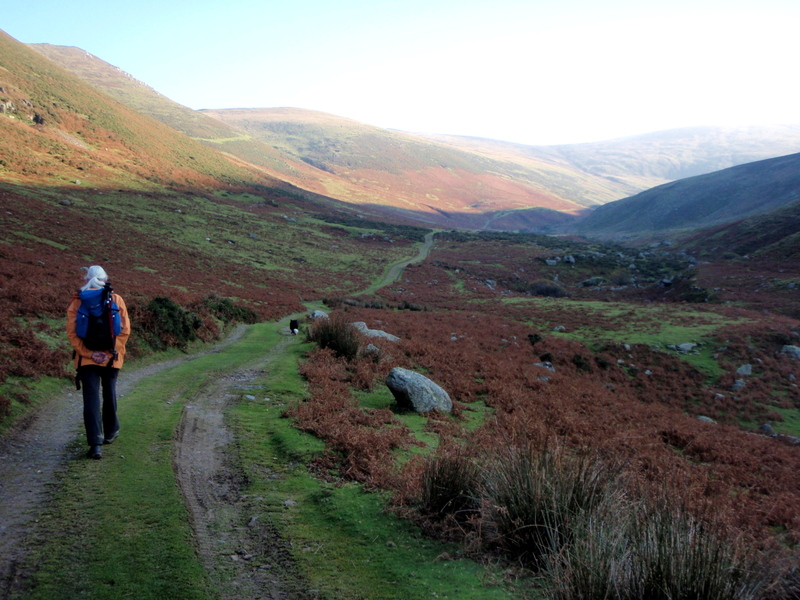 Further along the track above the river …. 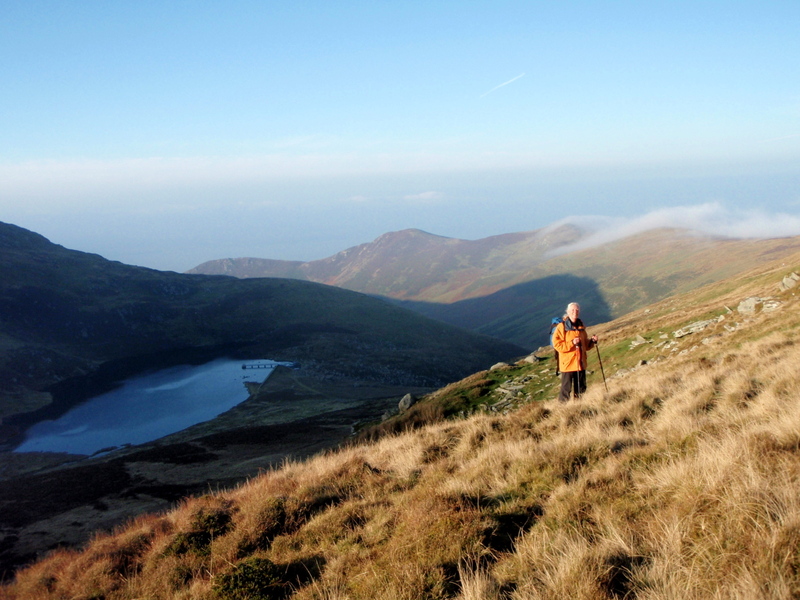 The plan was another wander in the mountains of the Carneddau. 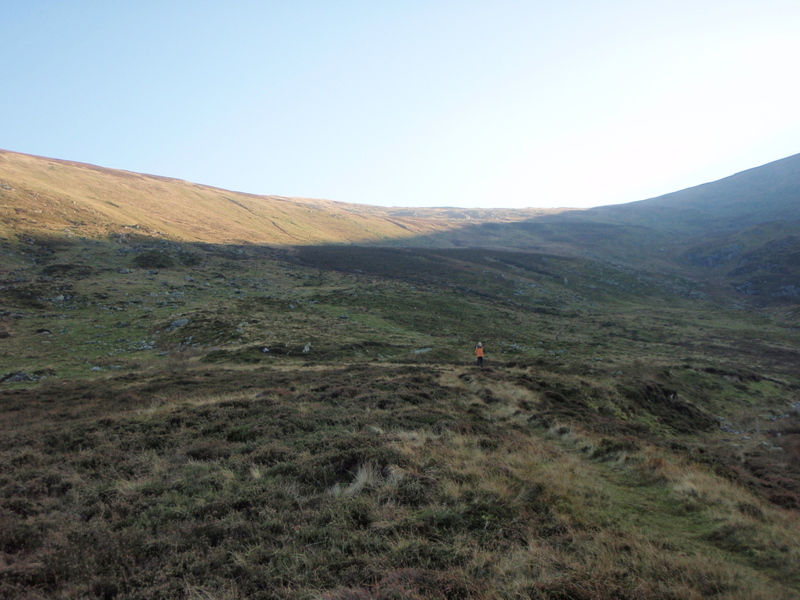 The walk was made easier by the fact that much of the outward leg was on a track, as was the return, with just one section in the middle ‘off-piste’. 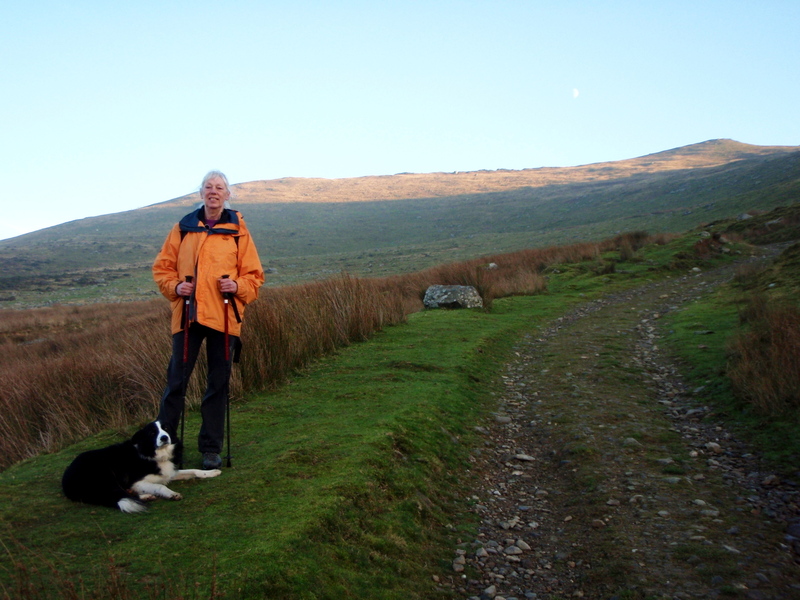 The track continues gaining height …. 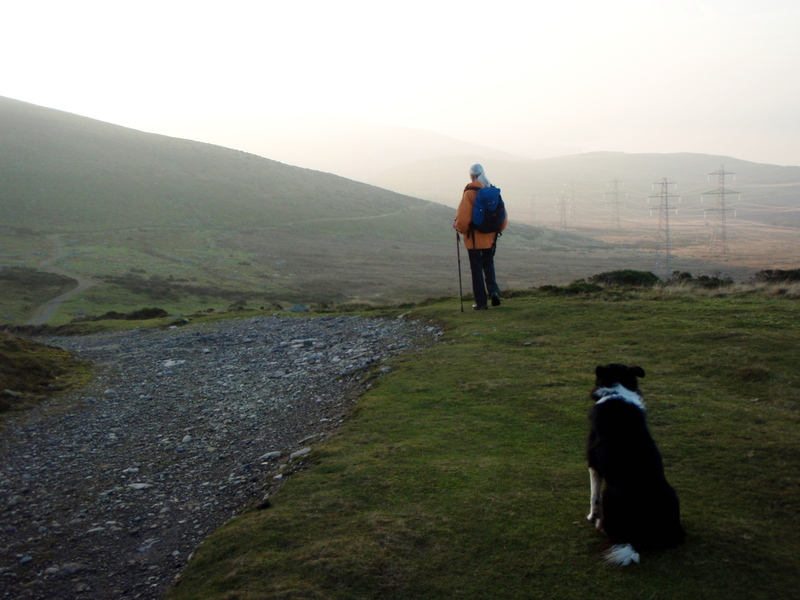 The track took us up to the lake of Llyn Anafon, nestling between the peaks of Drum and Llwytmor. 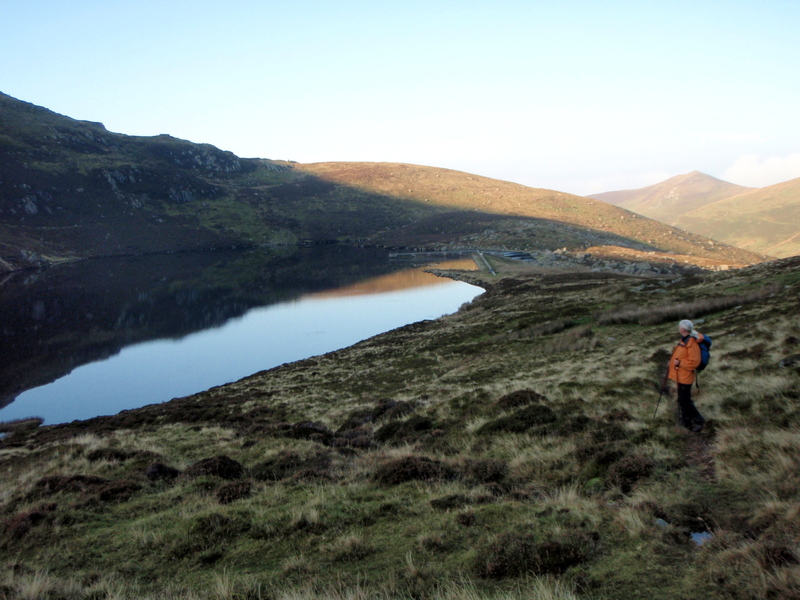 Like many mountain lakes in Wales, Llyn Anafon is a reservoir, but it blends in so well with the location that you might think it had been here since the last Ice Age. 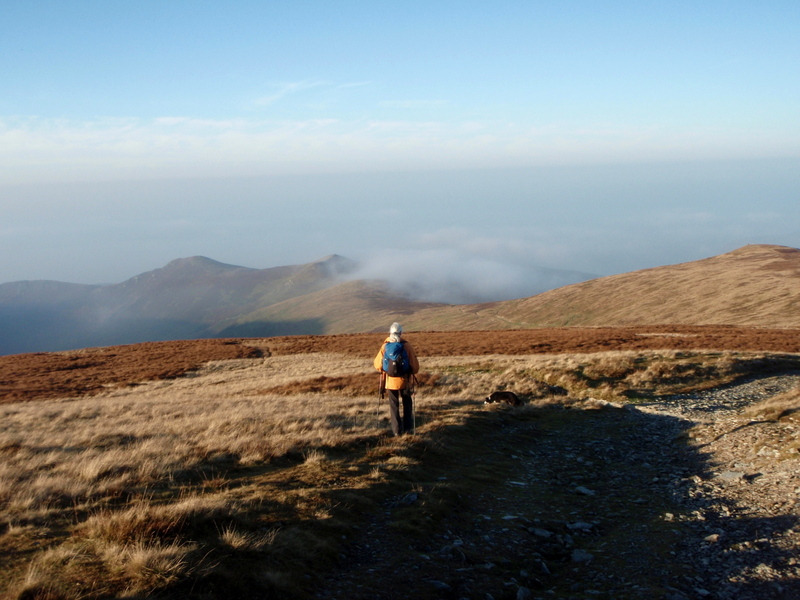 The route between Llyn Anafon and the ridge connecting Foel Fras and Drum was the ‘off-piste’ bit, with no track or path shown on the map. 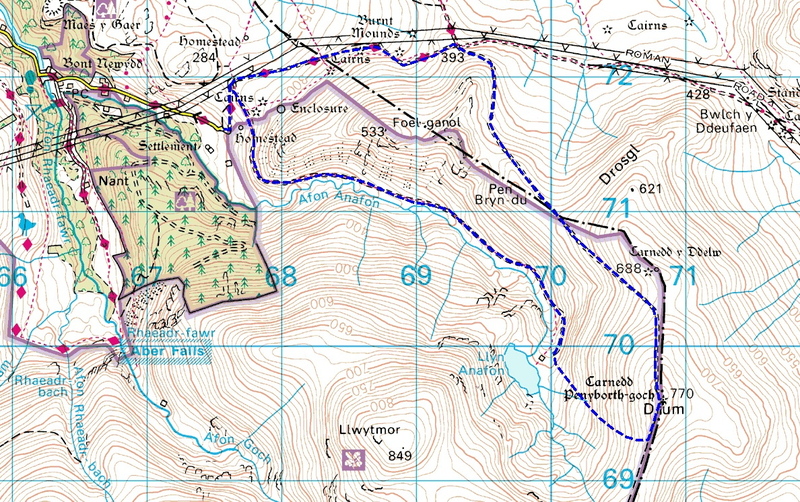 However, common sense suggested that this would make an attractive way to or from the ridge, and the contour lines on the map were far enough apart to indicate the route as being feasible. 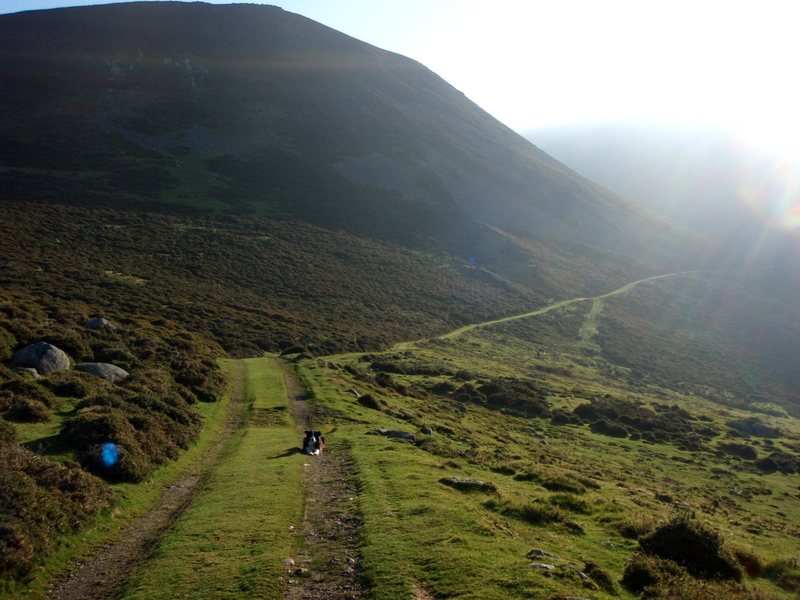 Sure enough, when we got there a couple of faint paths materialised, giving a steady climb of 250 metres (820 ft). 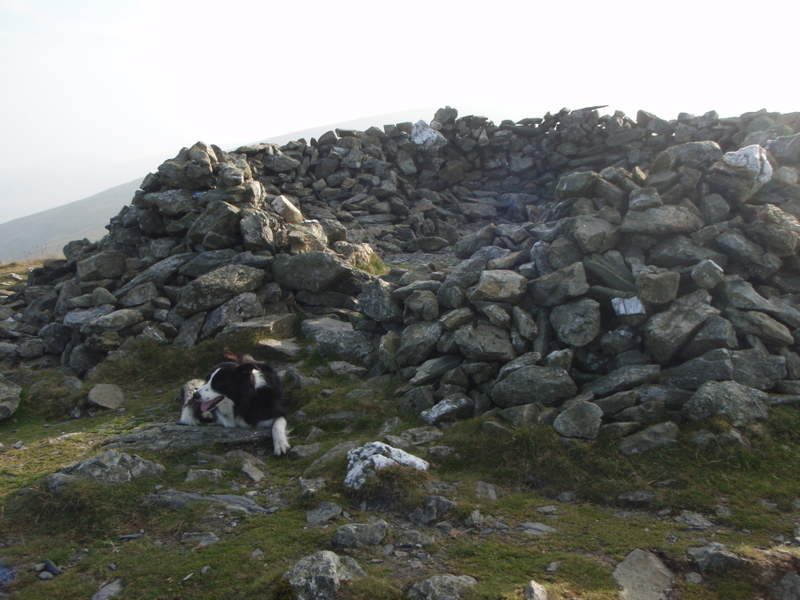 The summit of Drum ahead …. …. 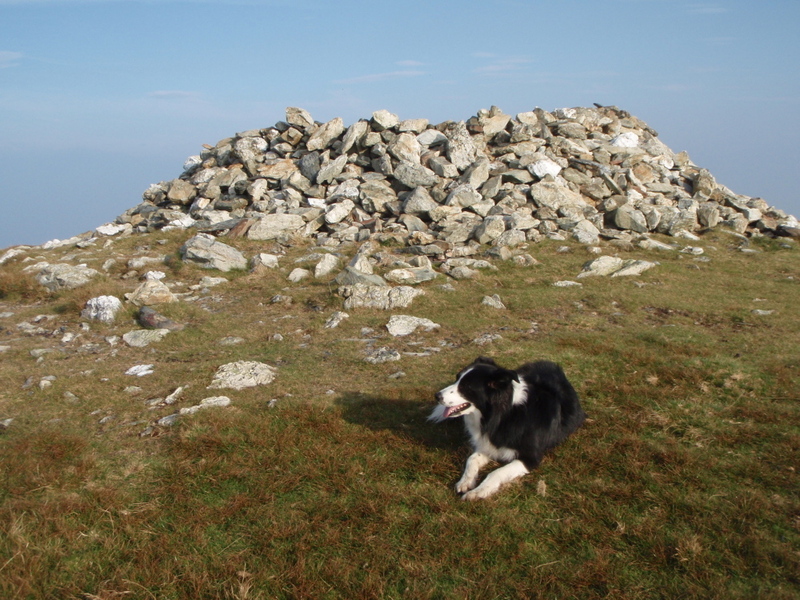 with the remains of a Bronze Age cairn on top …. 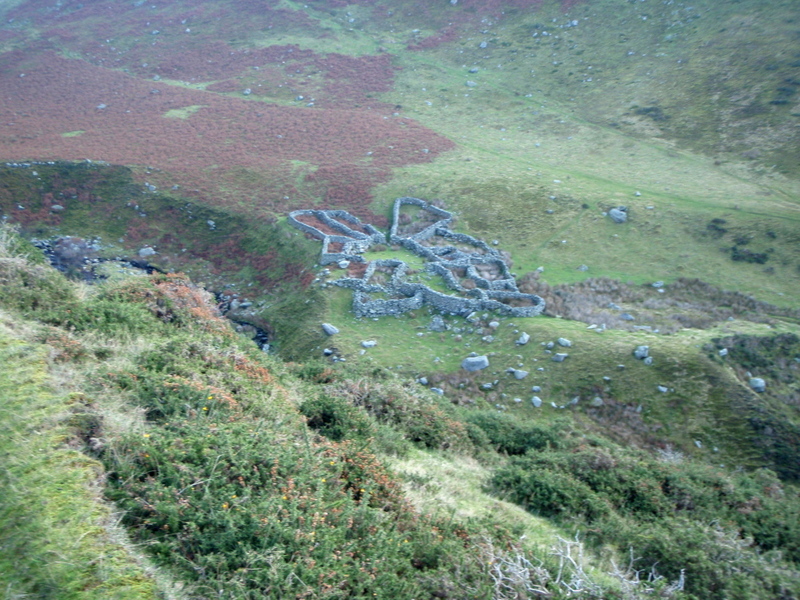 From Drum the return was easy, following the line of a more recent track used to transport materials for a radar station near the summit, now long gone – the purpose of the station was secret at the time, and even the mighty ‘Google’ fails to come up with any information as to its purpose. Leaving the mystery unsolved we headed down the track to join the old Roman Road, a relative new structure for these parts at a mere 2000 years old. 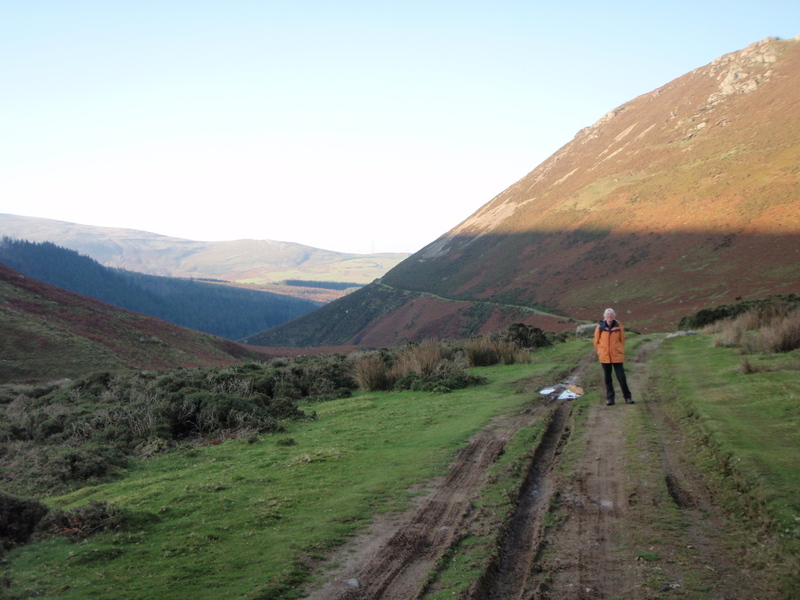 Last view of Drosgl …. p.s. Sorry to those of you who were looking for a new post two weeks ago – I was working away as safety crew on the Spine Race. This year the event took a real hammering from the weather, but the event went ahead and more importantly went ahead safely! 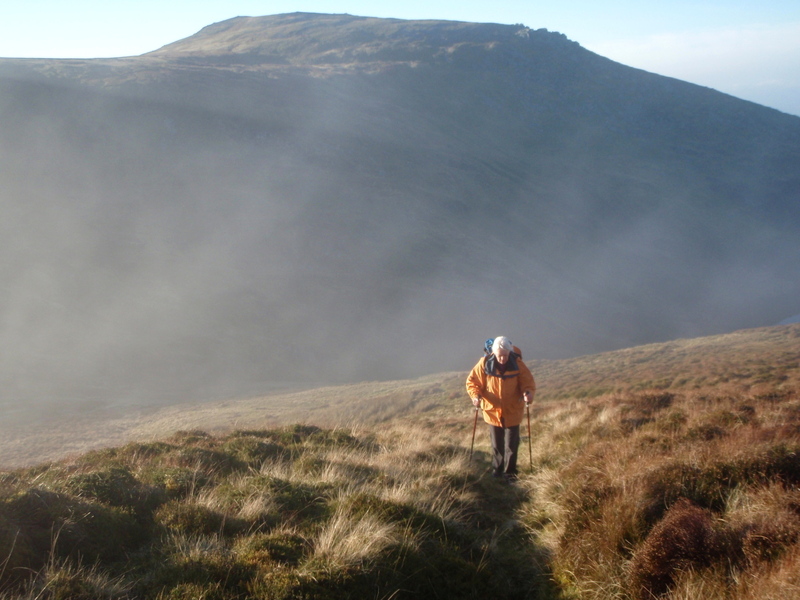 Love the mountain mist coming over the peaks. 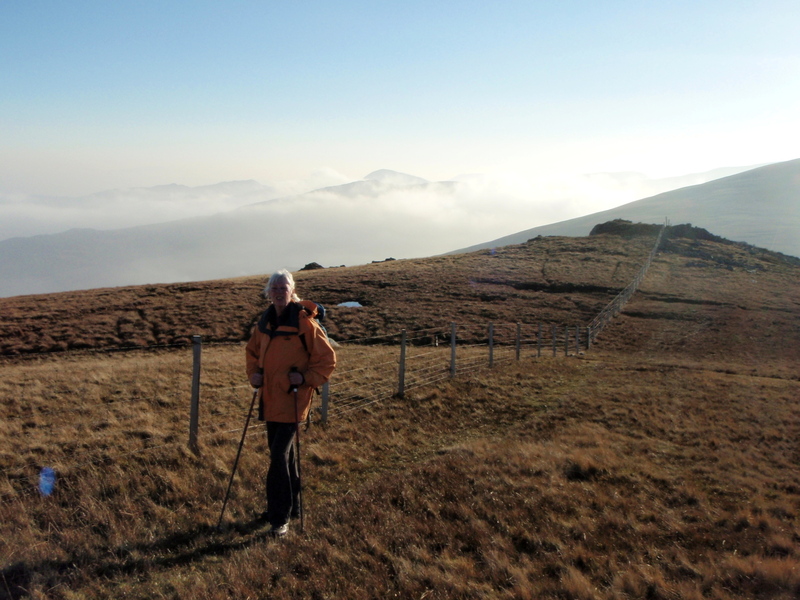 Obviously, not as much as I like to see Mist coming over the mountain peaks! Giggle! I’ve always rather liked the name ‘Drum’ and wondered what it was really like! Didn’t know about the radar station. 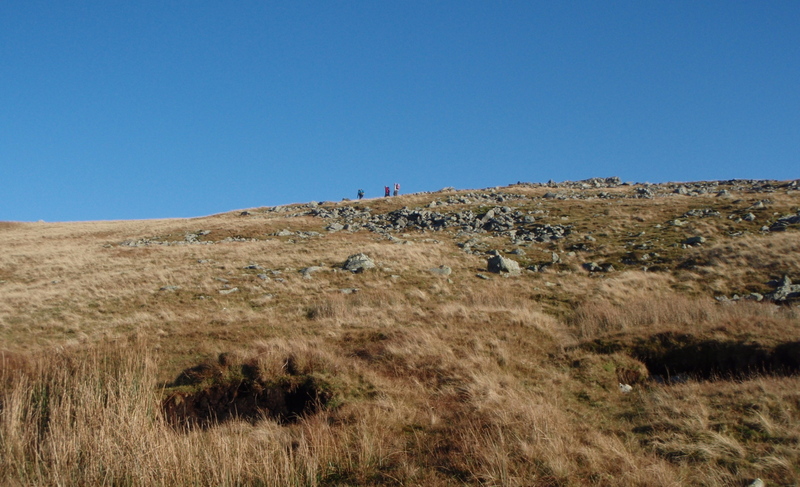 I’ve been up the other side of Drum but don’t think I’ve done the rest of that ridge. 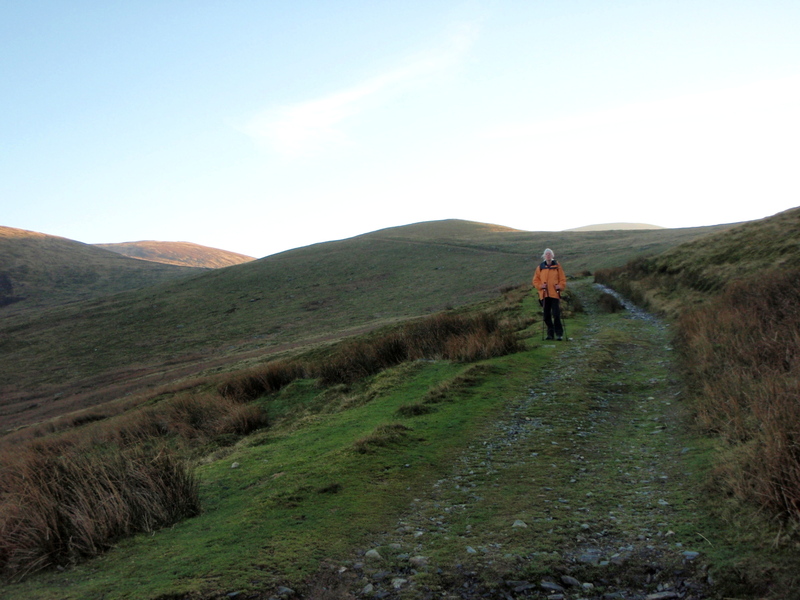 I haven’t been the other side of that pass either so that looks a nice walk for me when I eventually get back to Wales! The project was abandoned in the early 1960’s, when the nuclear threat changed from Soviet Bombers to long range missiles. The Canberra bomber that crashed on Carnedd Llewelyn in December 1957 was engaged in trials with the Drum radar installation. With your military past, you would probably find the history of the project interesting Carol. With my military RADAR past, I certainly would. We used to use Canberras on the range for target-towing – lovely aircraft 🙂 I knew a few of the crew too – lovely guys 🙂 Ours were 7 Squadron’s. 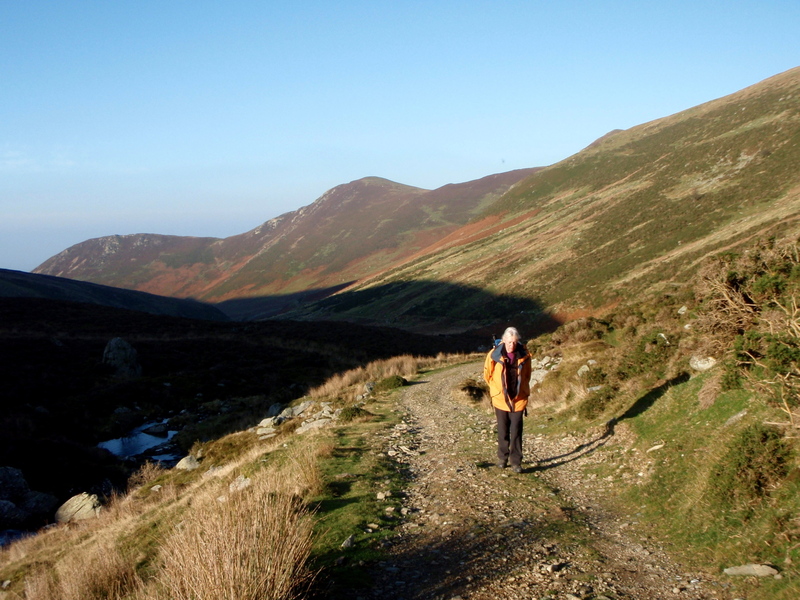 Great story about your friends father – I was in the Cheviots just over a week ago. 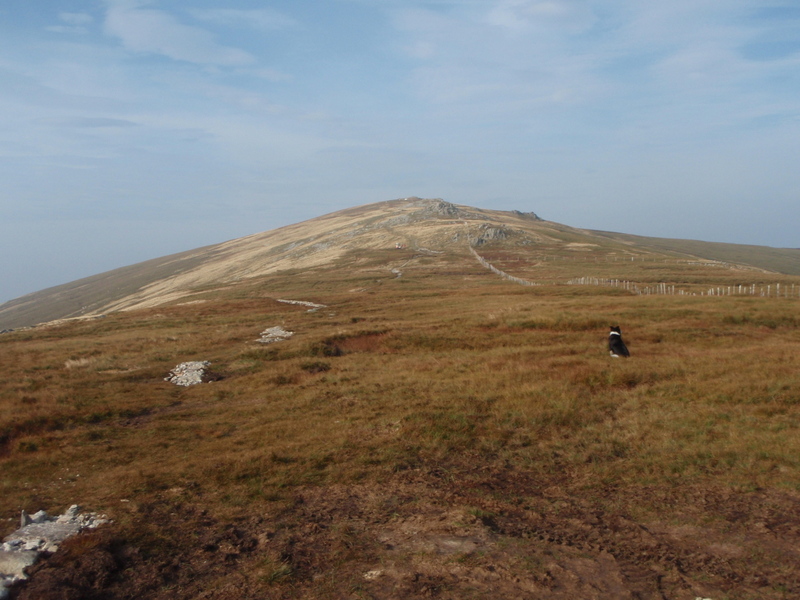 I have a book documenting air-crash sites in the upland areas of the UK, and I think I have the one you referred to – 16th December 1944, two crew members died in the crash but seven survived! I’ll visit the site the next time I’m over that way. 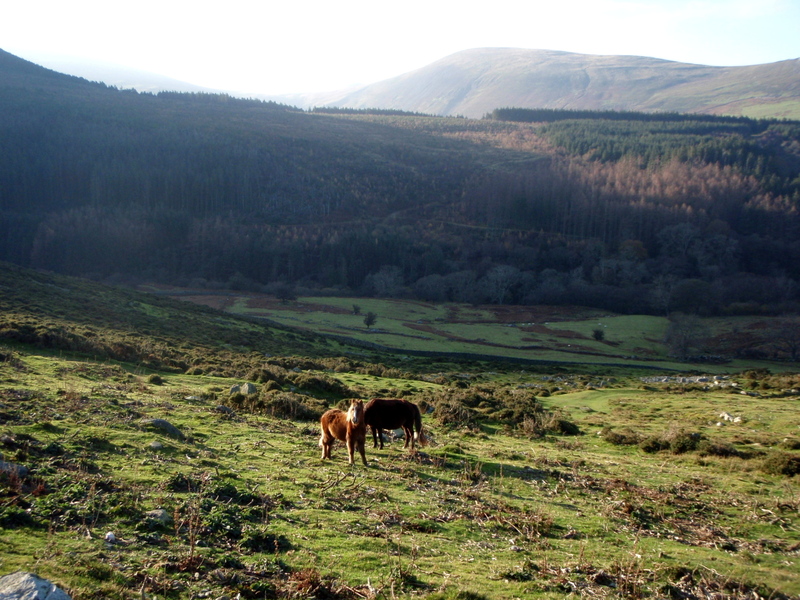 There are many such sites in North Wales, where I now live, and I often include the stories in my blog – if you click ‘Aircrash Sites’ on the top menu bar of my blog page you will see most of them. Many of the stories have sad endings, and many involve countrymen of yours, usually young men who died a long way from home. It’s not easy taking images and walking to a schedule. You have to take the scenes as you find them, and you do that very well, Paul. 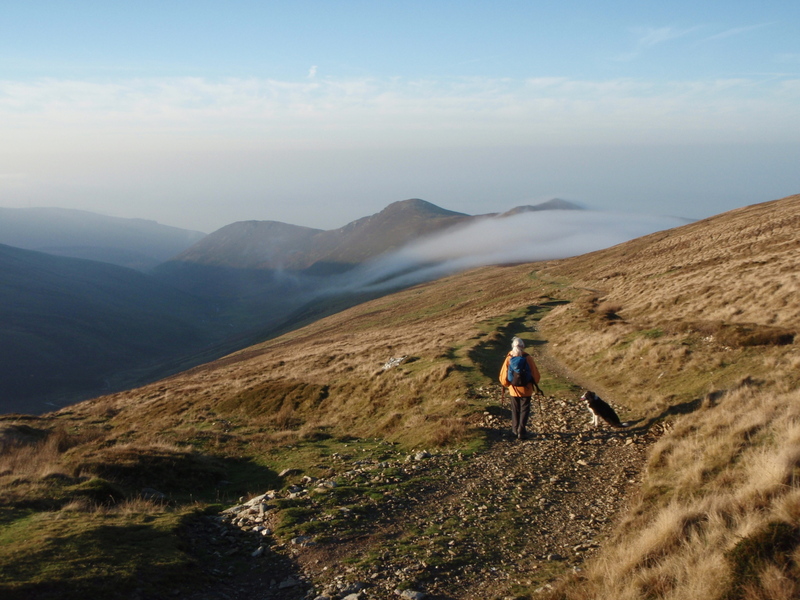 Superb photos Paul – looks an amazing walk! It’s one of those quiet corners SP, lovely stuff!